While a powerful storm spins in the Gulf of Alaska, and hurricane Harvey inundates the western Gulf Coast, a ridge of high pressure is dominating the western U.S. weather, bringing cool nights and above average daytime temperatures with only the slightest chance of light afternoon showers. This pattern will persist through midweek before a couple of waves of energy ejecting out of the Gulf of Alaska storm manage to dent the ridge and bring some moisture to the Intermountain West. The first wave around Wednesday will hardly be noticeable except for an increase in clouds and perhaps a better chance of a weak afternoon shower. The second wave for Thursday and Thursday night looks more significant, and we should have a good chance of showers later Thursday and Thursday night that may extend into early Friday morning. The western ridge rebounds behind the departing disturbance by Friday afternoon. It appears the ridge axis will move a bit further to the west as cool air begins to encroach upon the northern Midwest, though there is uncertainty as to how far west the cooler air reaches late in the long Labor Day weekend. The weather in Steamboat Springs will return to the usual late summer pattern of warm to hot dry days and cool nights for at least the first part of the weekend, with the possibility of some slight cooling by late in the weekend and early next week. A building ridge of high pressure over the western states will dominate the weather in Steamboat Springs this week. Ahead of the ridge, a storm that has just crossed the west coast near Vancouver, British Columbia will travel eastward across this northern U.S. border early this weekend with little impact on our sensible weather. Current cloudiness is caused by the remnant low pressure area over California that threatened, but did not impact, Monday’s eclipse viewing for northern Colorado (check out my account of the remarkable spectacle). Some remaining pieces of the storm are moving over our area today, but it looks like the threat of storms will stay mostly to our south for the rest of the afternoon. While there will be some ridging tomorrow, the western ridge builds in earnest behind the eastward moving Vancouver storm on Saturday. Much drier air will contribute to warm to hot days and cool nights that are typical for late summer in Colorado. Around midweek, some energy from the Pacific moves inland as it battles the dominant western ridge. There is uncertainty with respect to the evolution of this battle, but some increasing moisture is likely, leading to the chance of storms by midweek and lasting for a few days. At this point, anything more than possibly brief heavy rain looks unlikely before the western ridge is advertised to rebuild for the following weekend. I am still completely and utterly blown away. 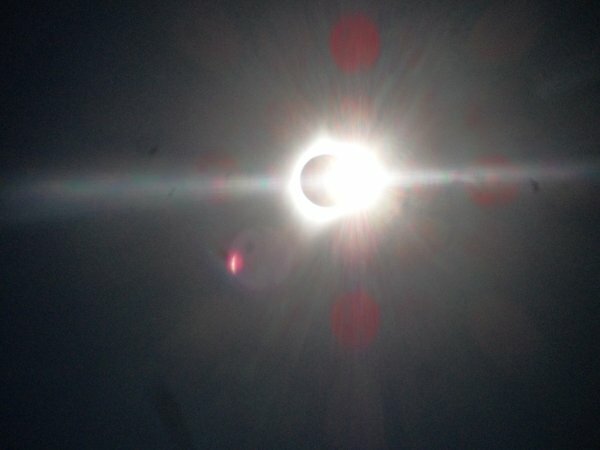 An emotional and visceral experience that was unimaginable, even after reading and watching videos and posts describing past total solar eclipses. An event so profound, awe-inspiring, spiritual, immersive and overwhelming that it left me shaking with excitement for a half hour after it ended with tears in my eyes. Even today, waves of emotion wash over me as I try to describe what I saw. The now obvious and undeniable fact is you must be there to witness totality. Only then will the event be seared into your consciousness for eternity. A friend and I left Steamboat Springs around 5 am, 21 August 2017 and headed for an area south of Casper, Wyoming. The early morning clouds did dissipate as forecast, though they highlighted a spectacular sunrise driving north from Walden towards Centennial, Wyoming. 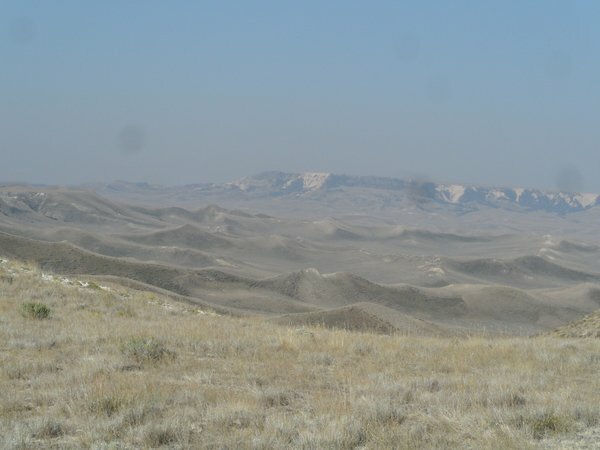 The view looking south from our remote eclipse viewing area when we first arrived, about 30 miles south of Casper, Wyoming. A view of our observation deck. Very low-tech, though there was a telescope with a solar filter behind us. The couple there were kind enough to let us view the partial eclipse phase both before and after totality. We could literally see the moon moving past the sunspots at around 50% coverage, as well as some solar prominences. A view to the north shows Ice Cave Mountain just south of Casper, with its stunning white cliffs, and the lunar-looking intervening landscape. As totality approached, the sun, as viewed through the eclipse glasses donated by a gracious friend the night before, became a thin crescent that steadily grew smaller and fainter until only an amoeba-looking remnant winked out of view. 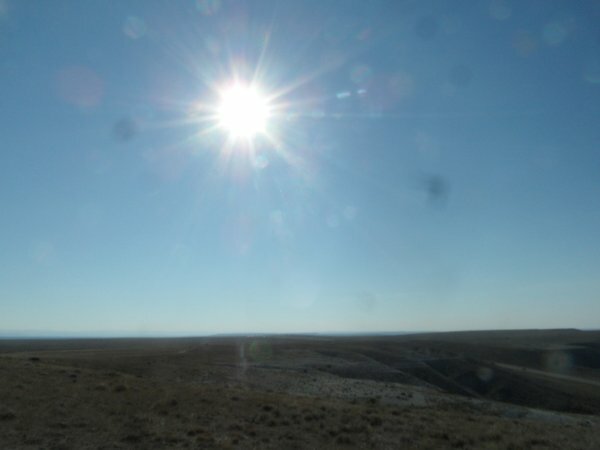 The valley winds suddenly died, the temperature dropped, and an eerie quietness enveloped the prairie as I removed the glasses to see a still-dazzlingly bright sun. At that point, the phenomena associated with totality began. Frankly, I forgot about the camera for the first half of totality as I was overwhelmed by the spectacle, but managed to take the following three pictures during the few seconds around the end of totality. You can see the star Regulus, Leo the Lion’s brightest star, shining through the corona in the southeast quadrant of the first picture. At this point, the Shadow Bands, also present for a short time as the eclipse first dipped into totality, reappeared and danced across the landscape, even as a 360 degree sunset/sunrise surrounded us. These diffuse and eerie bands of light are caused by the few remaining rays of sunlight diffracting around the moon, and are mixed in with the impossibly sharp shadows present around totality. Now we are just a split second past totality when a brilliant flash of white light, termed the Diamond Ring, briefly appears. 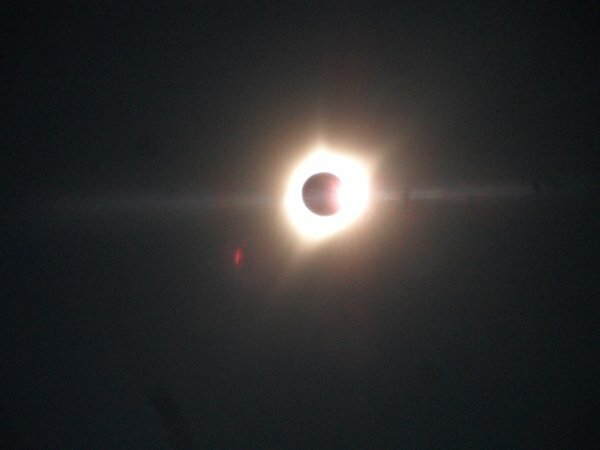 This is also present just before totality, when the last ray of sunlight slides around the moon, and seeing it flash felt like a hammer-blow to the head; a sledgehammer to the soul. 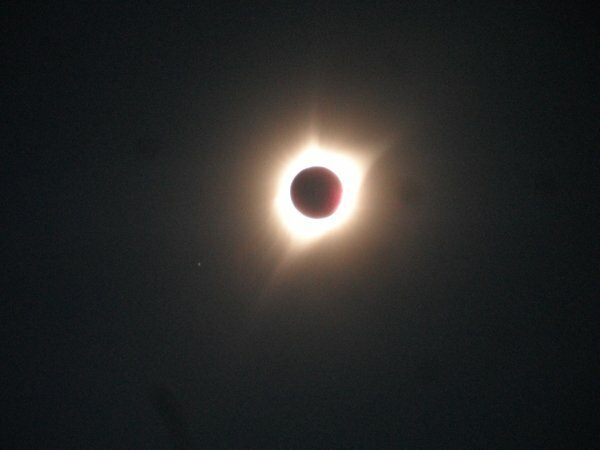 I mean, I expected to see something, as the effect is well discussed, but I was not expecting an infinitely bright and compact flash of dazzlingly pure white light that was immediately followed by the deep blackness of the moon covering the sun at the start of totality. An instantaneous change between blindingly pure white and infinitely deep black that took my breath away. Not that I was looking, especially as a scientist, but as totality ended, I could not imagine a more literal interpretation of Let there be light. The Diamond Ring below is still in the process of expanding, even though the flash of light appears vanishingly brief. We just sat there for a half hour, in befuddled amazement, trying to make sense of what we had just witnessed, while reveling in the final phases of the eclipse. Finally, we grudgingly left our observation deck and, looking to escape the traffic, took the gravel road less traveled by. 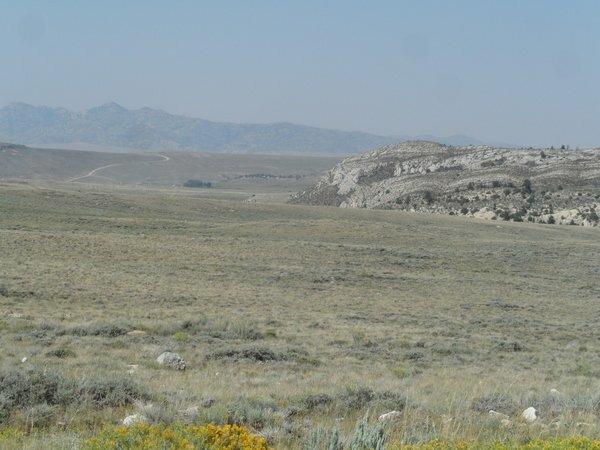 The Bighorn Mountain Range frames the serpentine escape route with this northeast view. 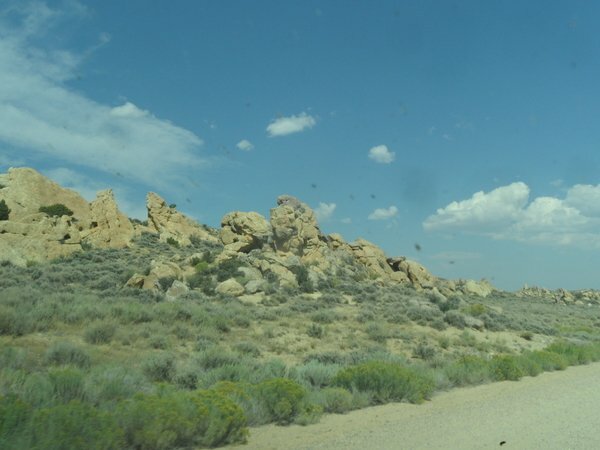 Some nice granite outcrops while we were avoiding traffic on the 60 mile loop of gravel roads. 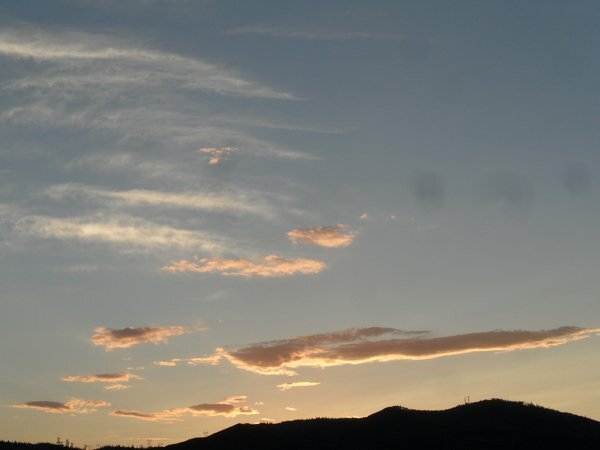 Back in time for sunset in beautiful Steamboat Springs. A wave traveling over the top of a ridge of high pressure in the Gulf of Alaska has split, with the northern part of the split moving across Montana and the Dakotas tomorrow. The southern end has taken up position off the California coast, and the southwesterly flow ahead of that area of low pressure will encourage northward transport of moisture over the Steamboat Springs area around midweek and heading into next weekend. There may be some sprinkles this afternoon, though any storms are likely to produce far more wind than rain as the lower atmosphere is quite dry and any precipitation will largely evaporate before reaching the ground. For Monday, eclipse day, models have generally trended towards a more cloud-free solution for northern Colorado and southern Wyoming. The wave to our north will drag a couple of weak cool fronts through northern Wyoming tonight and early tomorrow. There may be some clouds ahead of and along the fronts, though current forecasts have the fronts east of Casper, Wyoming by noon on Monday. Therefore, skies will be improving through the late morning, hopefully in time for an unobstructed view of the 2017 solar spectacle. Areas to our south may not be quite as fortunate, though models have trended drier with their noon forecast as well. There will be a chance of some storms across all of Colorado by the afternoon or early evening, most numerous to our south. After a dry Tuesday, pieces of energy are forecast to eject northeastward from the California low, reaching our area around midweek even as a brief ridge of high pressure builds over the Rockies. There is uncertainty with respect to the interaction between the low to our west and the ridge of high pressure over our area, with models trending weaker with the surges of moisture and energy. The end result is an uptick in chances for storms starting around Wednesday and lasting into the first half of the weekend, though the threat of more than brief heavy rain currently looks small. By around Thursday, a strong storm crosses the southern British Columbia coast and travels along the U.S. - Canadian border over the weekend. This will sweep the ridge of high pressure and the California low eastward, with the unsettled weather ending by mid-weekend and being replaced by Colorado’s quintessential late summer weather with warm, dry days and cool nights. A surge of cool air moving southward from the North Pole has created a wave in the polar jet stream that is currently passing through Montana and the Dakotas A weak cool front associated with this wave will be dragged through the Steamboat Springs area overnight with little sensible effects on our weather. The western ridge rebuilds behind the wave, bringing warmer temperatures and drier air for the weekend, with only a small chance of afternoon storms. Concurrently, another surge of cooler air from the northern latitudes produces an additional wave that crosses the southern British Columbia coast on Friday. This will temper the strength of the ridge as the bulk of the storm again travels north of our area. Notably, part of that wave splits and forms a trough of low pressure off the California coast that loiters there for at least part of the work week. As this trough forms over the weekend, the upper level flow backs from the northwest to the southwest, and mid and upper level moisture increases by late in the weekend, especially for areas to our south. This could threaten the viewing of the 2017 solar eclipse on Monday, though right now it appears there is enough dry air lurking to our north to keep the clouds at bay for the Steamboat Springs event. Areas further south might not be as fortunate. 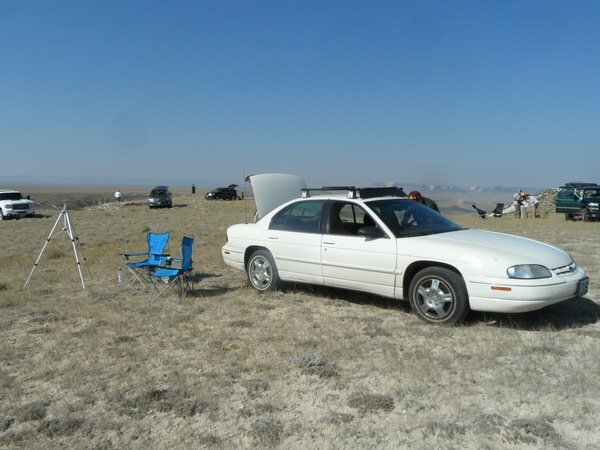 And for those traveling north to Wyoming to view the spectacle, the chances for mostly cloud-free viewing are higher. 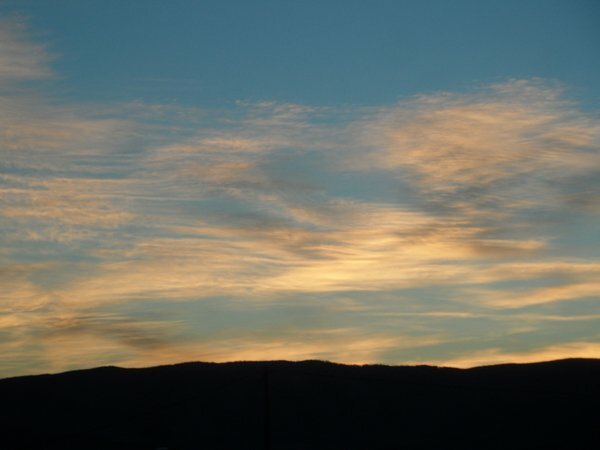 The western ridge is forecast to amplify further through the work week, bringing even warmer temperatures to the area. While models eventually move the California trough eastward, attendant with good chances for rain, the European ECMWF has trended slower than the American GFS. The slower solution allows the western ridge to rebuild, and the ECMWF then has the trough lifting northwest of our area, keeping conditions much drier than the American model for the end of the work week.